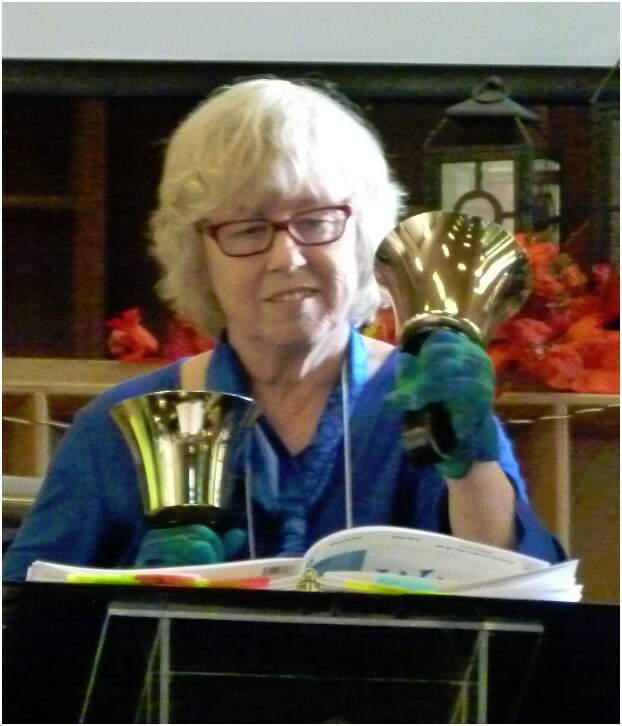 Alison Wood was the fifth recipient of a Life Membership in the Alberta Guild of English Handbell Ringers. It was awarded to her in 1997, which ironically was the first year since the Guild was founded that she did not serve on the Board in some capacity! Therefore the announcement came as quite a shock to her. Although Alison has received many kudos and awards during her lifetime committed to handbells, it is her Life Membership of which she is most proud. When presenting her award, the President of the Guild at the time, Stan Morris, began by joking about the number of times Alison’s name had appeared in the previous minutes. He then read the citation which outlined her contributions to ALGEHR up to that time. Alison was a Charter member of the Alberta Guild. As such, she was one of the core group of inexperienced but passionate ringers that worked to fulfill the dream of creating a not-for-profit Society devoted to the art of handbell ringing. Those were challenging days of developing policy, procedures, and programs; learning the rules and regulations of the Alberta Society’s Act; taking Board Development workshops; providing programs throughout the province; managing financial difficulties; documenting, evaluating and adapting all activities and all the while attempting to meet a wide variety of needs and wishes. Alison experienced the excitement, anxiety, and the trepidation that come with the birth and growth of an organization. In the first seven years, she served on the Board in the positions of Director, what became Vice President North, and Membership Chairperson, and was happy to employ her non-ringing skills in the background to support the leaders and do the everyday tasks required to foster the establishment and growth of the Guild. Leadership was a task for which Alison did not feel suited, and she had spent her life avoiding it. One of the things that so attracted Alison to handbell ringing was the complete focus on being part of the group where all were equal and the goal was to blend in. Even when she established new bell choirs, she worked quickly to teach new ringers the required skills so that she could recruit a good director and go back to the joy of ringing in the choir. Taking on the position of President of the Guild in 1990 was a leap of courage for her, but knowing that ALGHER, still in its youth, was committed to hosting the Fifth International Handbell Symposium - a world class event – Alison felt she had no choice. She was driven by her passion for the Guild, her belief in its quality, her determination to raise the profile of ringing in Canada, her previous experiences attending Symposia, and her desire to ensure that ALGHER gained the respect of the international handbell community. The two years that were supposed to be the term of her presidency were unbelievably busy. Along with the demands of her teaching job, Alison continued to provide workshops and youth festivals, wrote articles for The Peal, taught a number of handbell clinics, and fulfilled the usual presidential duties. At the same time, she continued the role assigned to her previously by Symposium Chairman Peter Bortolin - Workshop Chairperson for the Symposium. There had already been more than a year of planning by the time the presidency began, but as the highs and lows of the planning proceeded, (complete with inability to raise required funds, ever-changing registration numbers, and communication difficulties that could be expected in a world that relied on snail mail and translators skilled in English, Japanese and Korean) Alison was not the only guild member who feared personal bankruptcy! The time commitment and meetings required multiplied, and the questions that poured in from presidents and workshop clinicians meant long nights of letter writing. In the area of Workshops, Alison and her committee developed an extensive list of international handbell directors and Edmonton instructors who could offer a myriad of ringing and culture classes, as well as wellness workshops. When the final list of 40+ workshops, each to be offered at least twice, was completed and in the registration booklet, it became obvious that preregistration would be prudent so that appropriate venues were matched to participant interest, clinicians could have some idea of how many might attend, and translators could be placed strategically. Two months before the Symposium, in a time when FAX machines were brand new, personal computers were a novelty, and digital communication was rare, Alison personally pre-registered more than 550 participants into their choice of 7 workshops from the 40 available, and with her committee developed a logistics list for each venue. At the last moment, at the request of teachers, yet another piece was added to the Symposium – a youth program for Edmonton’s young ringers to be offered on the first day of the event. This was added to the workshop list. Always working to create a quality product, the Youth Program allowed the participants to improve ringing skills, receive instruction from three of Alberta’s top clinicians and three experts from the United States, as well as the opportunity to participate in cultural classes from Japan and Canada’s First Nations. The achievement that gave Alison the most pleasure during this productive planning period had its roots at a meeting in her living room - the improvement of the relationship between the three Canadian Guilds that existed at that time, leading to the establishment of the Handbell Guilds of Canada, complete with procedures for choosing Canadian conductors, clinicians and representatives for the international scene; developing and launching the Canadian Composition Competition; and establishing an annual meeting for Guilds which was to occur face to face or voice to voice, a communication factor so important to maintaining positive relationships. Despite the fact that the Guild had a ridiculously small amount of seed money, was unable to get government grants, and did not attract the expected registration numbers, the event was a huge success. To this day Alison is amazed with all that the Symposium Committee was able to accomplish with its limited size, experience and resources. “It’s nothing less than magical”, says she. “It was the result of the hard work of all involved”. She credits Peter Bortolin for his skill in choosing the right people for each job, keeping a handle on finances and holding meetings to address changing circumstances. The symposium actually made a profit thanks to the hard work of all involved, the advice and support of the Edmonton Convention Centre, the fact that Japan brought extra ringers when the quotas of other countries were not met, and the decision to charge the public admission to the concerts. The potential income from admission fees was not part of the original budget, thus it was all profit. This gave the Alberta Guild a strong financial base for the first time since its inception and allowed for the development of an endowment fund, which is still active today supporting individual ringer projects, Guild incentives, and contributing to the work of the Handbell Guild of Canada. Little did she know that while writing the requested manual, Alison would be required to serve a second term as President. It was the first time that anyone served a second consecutive term in that role, but there was no-one else to take over the position at that time. Despite exhaustion from the Symposium, the endowment fund was established, in-roads were made with new initiatives, and the Guild continued to offer valuable programs for Albertans. Representing Canada at International Symposia was done on a rotating provincial basis, and as it was ALGEHR’s turn to fill that role, Alison was honoured to attend the Symposium in Adelaide, Australia in 1994, and present copies of the manual to each guild. She felt confident that her input reflected the thoughts of all guilds, as she was diligent in sharing and collecting information. What she did not expect was that she would also be required to conduct the massed choir in Australia in playing Fred Merrett’s arrangement of three Canadian folksongs! Carol Petrie of Saskatchewan, who had taken over that duty from OGEHR’s Marjorie Slinn when asked, had been forbidden by her doctor from attending, and Alison had five days to learn the piece and get ready to teach it. To add to the irony, all other conductors had been given the instruction that they were to share the history of their guilds at the final concert before their piece was played. Alison found out about this little requirement while sitting on the stage waiting to direct the third piece. While speaking off-the-cuff about Canada and its guilds to the audience of 2000, she realized that her love of ringing made her face her worst fears on a fairly regular basis! The decade of accomplishments that resulted in her Lifetime membership occurred right in the middle of her life as a ringer. At the upcoming symposium in Vancouver in 2016, Alison will celebrate a half century of devotion to the art of handbell ringing. She was 12 when the music director of Robertson Church in Edmonton, Mr. Douglas Millson, a Church musician who had a profound effect on many Albertans, bought a set of handbells for the church while shopping for a carillon for the Alberta Legislature Building. He was hoping this instrument might convince the teenagers of the church to stay in the music program at a time when the church was not as important in their lives. Alison was one of the few 12-year-olds who were invited to join “the big kids” to play in his first bell choir. It only took a few practices for Alison to realize that there was magic in this instrument. In a matter of weeks she saw and was amazed by the fact that this choir of ringers, each with their 2 to 4 notes, sped up and slowed down together, built crescendos and decrescendos together, and their hearts seem to beat as one. The choir may not have been with their director, but they certainly were together as a group. Up to that point, Alison had never really felt that she belonged anywhere. Handbell choir was the place where she fit in well with people who were older than she was, and she was just as important to the group as the teenagers. In 1966, the correct technique for playing bells had not yet been developed. Bells were set in keyboard order for the director and ringers played by flicking the wrists. However with Mr. Millson, musicality was always the goal and the Robertson Bell choir played often, took small tours around the province, won music competitions, and became a family. Alison has fond memories of practicing air handbells with Beverley Bassett (Martin) during Social Studies class; playing at Jan Millson's wedding; holding a reception for Bob and Kathy deFrece; trips to Three Hills and Pincher Creek; and the magic of bell music. In 1971, Robertson amalgamated with Wesley United Church. Shortly after that, the bell choir name changed. Unfortunately, Mr. Millson and his wife moved to Ontario soon after that time, but another member of the original choir, Bob de Frece, took over all the bell choirs, and Alison continued to play in the senior choir until her first year of teaching. Alison had not intended to be a teacher, but needed something to do until she figured out what she was going to be when she grew up. After a year of education courses, she was placed at two schools, teaching grade 5. Her background with church choirs and music lessons resulted in the School Board deciding that she was qualified to teach Music and French as specialty subjects. With no classes in how to teach music, she felt very uncomfortable until she found that Edmonton Public schools owned 15 sets of handbells that could be borrowed for half a year. To do that, teachers were required to take a three week course in Handbell ringing from Fred Merrett of Harry Ainley High School. By that time Alison had rung for nine years, but did some serious re-learning of technique under Fred. No other teacher had that kind of experience at that time. Soon Fred and Alison were working together to educate teachers about handbells. Classes for teachers were taught by both Fred and Alison, and informal festivals, which included choirs of all ages and stages, were begun in Edmonton. In 1979, the bells had not rung at Robertson-Wesley for half a year and Alison started a new group of ringers which she ran for a year until their skill level was good enough for her to ask Bill Hutton to take over as director so that she could follow her love of ringing. In 1985 after her first workshop as a clinician for the Guild, she was asked to start a choir for teachers and their friends. This became Bronze Harmony, and when Fred Merrett agreed to conduct, Alison rang in that choir for many years. For the 32 years of her teaching career, in her role as a classroom teacher with a variety of specialties, Alison ran between two and three co-curricular handbell choirs each year as well as teaching bells in her Music classes. Her enthusiastic and dedicated students in York Elementary, Rutherford Elementary and Greenview Elementary became well-known for the quality of their performances, the difficulty of the music they could play, and the beauty of their technique. Among many highlights of her teaching years were the support parents gave in raising money to buy bell sets, the times her choirs were asked to play at the Edmonton Public Night of Music, and the fact that her children seemed to blossom with confidence, poise, and professionalism in performances and at Handbell Festivals. Alison did not audition students for her choirs and most could not read music when they joined. They did leave with those skills as handbells are effective in teaching music and extremely valuable in teaching teamwork and responsibility to a group. In 1990 Alison’s handbell program at Rutherford School was one of two Canadian choirs to receive the first American Guild Award for Exemplary School Programs. She also ensured that the Youth Handbell Festival occurred by heading the organizing committee for nineteen years. Alison has a love of learning and spent many summers travelling to see sights and learn from the master handbell clinicians at National Directors’ Workshops in the States, Handbell Explorations in Arizona, and at Symposia. She was pleased to see that the style she had developed through the years in Canada was accepted, and that even bell clinicians demonstrated cooperation and mutual respect instead of competition. Alison took lessons in solo, duet and ensemble ringing in the States, change ringing and off-table classes in the U.K. and took conducting classes whenever they were offered. She began working as a clinician in 1985 at the Guild’s first workshop, and by the time she received her Lifetime Membership, she had given countless workshops in all parts of Alberta and abroad for a variety of churches, schools, and musical organizations on topics including Beginner, Intermediate, Advanced, Solo, Duet, and Ensemble Ringing; Use of Bells in Schools, Education and With Children; Musicality; techniques for treble and bass bells; 4-in-hand ; musical artistry; Conducting; Starting from scratch; the History of Bells, Preventing Ringing injuries (based on the ALGEHR booklet written by Carol Bergum and the physiotherapist who taught at the Edmonton Symposium, David VanDriesum); adjudicated a number of festivals, was one of the clinicians several times at the International Music Camp, worked in B.C., Saskatchewan, the U.S., Australia and Scotland. After receiving her award Alison continued to “feed her handbell addiction” by continuing to ring at Robertson-Wesley; working to develop the Handbell Guilds of Canada; attending all Ringing Links and all subsequent Symposia, often as a clinician; serving a three-year term as Chairperson of the Handbell Guilds of Canada; two years as Executive Director-Elect of the International Handbell Committee; and four years as Executive Director. Alison finally learned to enjoy the role of conductor during the nine years she had the privilege of directing the bell choir at Riverbend Church; as well as the short stints in which she conducted the Robertson-Wesley Ringers when new music directors needed to learn how to play bells, or established conductors needed a holiday or to give birth! During her time at Riverbend, enough money was raised to buy the fourth octave, and the last four bells of the fifth were bought with memorial donations from Alison and the Bamforths in memory of their parents. Alison rang in the first concert ever played by the choir that became Jubiloso! However, by that time she knew that life was about to interfere with her goal of ringing until she died. The health issues that started appearing the year after her Life Membership were eventually diagnosed as Parkinson’s disease in 2003. Alison works hard to accept the challenge of dealing with the effects of this progressive incurable disease, but cannot deny that the loss of ability to participate in this, her life’s passion, has caused the most pain and grief. She is extremely grateful to those who encouraged her to continue directing them despite shaky hands because they knew she still had things to teach them; and to the members of Jubiloso! Bells of Concordia, who invited her to be their Artistic Advisor. Offers of continued involvement; the massed ringing opportunities at Symposia, Ringing Links, Classic Bronze; and tours with Witte Travel to ringin Israel, Finland and Estonia have allowed Alison to keep connected to the ringing world that is so much a part of who she is, and even to ring again. She can count on the others who have the same bells to play her part in the hours that neither she nor the drugs can control her body, and the welcome from new ringing friends and the travel agent is her lifeline of hope. Alison Wood has a lifetime of treasured, unique handbell memories including directing and playing solos in Dunblane Cathedral and the chapel in Scotland where Mary, Queen of Scots, was christened; of First Nations youth in Canada , Australian and Singaporean children in Australia, and British people of all ages in Dunblane Cathedral processing to the poem she wrote about ringing; of the concert she spearheaded to celebrate the tenth anniversary of ALGEHR in which all compositions were written by Canadian composers - one of whom was a ten-year old boy who was performing in her Rutherford School choir that night; of the excitement of seeing 200 registrants in Japan playing spoons and dancing to the Rankin family in each class she gave on Canadian culture, despite their expectation that they would be making Canadian Potpourri; of conducting the massed choir in Australia in 1994, in Scotland at Britain’s First Ringing Week and at Ringing Link in Edmonton in 2000; and of countless magical, heavenly experiences of making incredible music with incredibly wonderful people in so many parts of the world. It is a rare thing to discover a life passion, be able to follow it, and be honoured with a Lifetime Membership for one’s contribution to it. Alison Wood is extremely aware that she is one of the luckiest people on Earth.